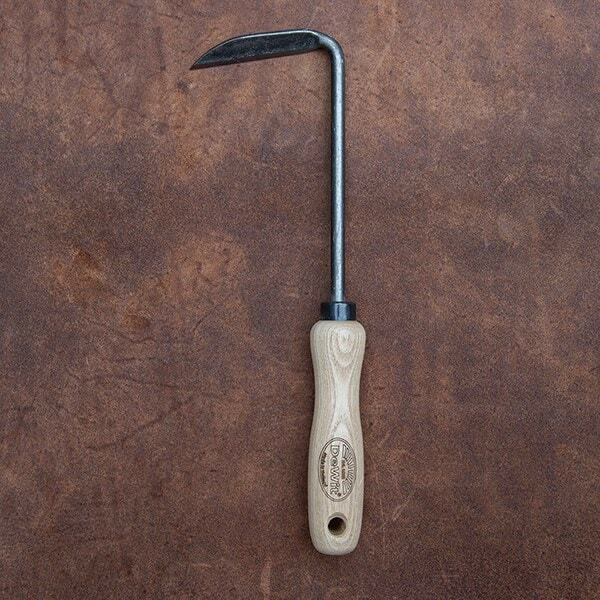 Buy De Wit cape cod weeder: <ul><strong><li>Exceptionally strong high-carbon steel</li><li>Easily cuts weeds below the soil</li><li>Lifetime guarantee</li></strong></ul><br>Hand-forged and tempered from a single piece of steel, the De Wit Cape Cod weeder is an exceptionally sturdy tool for tackling weeds wherever you find them. Hit stones and rocks galore, you'll never damage this one!<br><br>Made from high-carbon steel with a sharp blade edge, the tool lets you slice weeds just below the soil's surface, cutting them off cleanly at the roots.<br><br>Grip it firmly by the chunky ergonomic handle, insert it under the soil and pull it along sideways to clear large areas of weeds, or use the pointed end to target tap roots and weeds in tight spots - for example, between paving slabs or in densely planted beds, borders and rows.<br><br>Besides weeding, you can also use it to help you cultivate compacted soil - drag it along to loosen the soil and create deep ruts for planting.<br><br>A superbly crafted, versatile tool that almost makes weeding a pleasure. Almost!<br><br>Please note: this tool is designed for right-handed use.<br><br> Measurements:<br>Head 8cm wide (3.25”)<br>Total length 30cm (12”)<br><br><strong>About De Wit tools</strong><br><br>The Dutch are renowned for making the world’s finest garden tools, and De Wit is the most respected name of all. Founded in 1898, the family-owned toolmaker combines old-fashioned quality and craftsmanship with innovative design to create superior tools that last a lifetime.<br><br>Every tool is hand-forged in the Netherlands from tough boron steel - shaped, sharpened and burnished for durability, giving it the same blackened patina as traditional Edwardian tools. Each is fitted with an FSC-certified solid ash handle for ultimate strength and shock resistance, oiled to provide first-class protection against the elements.<br><br>All De Wit tools come with a lifetime guarantee against manufacturing defects, making them a truly once in a lifetime purchase. I wouldn't be without this tool in the garden. The De Wit Cape Cod weeded is a brilliant tool for tackling weeds in your borders with great efficiency. It is extremely comfortable to hold. 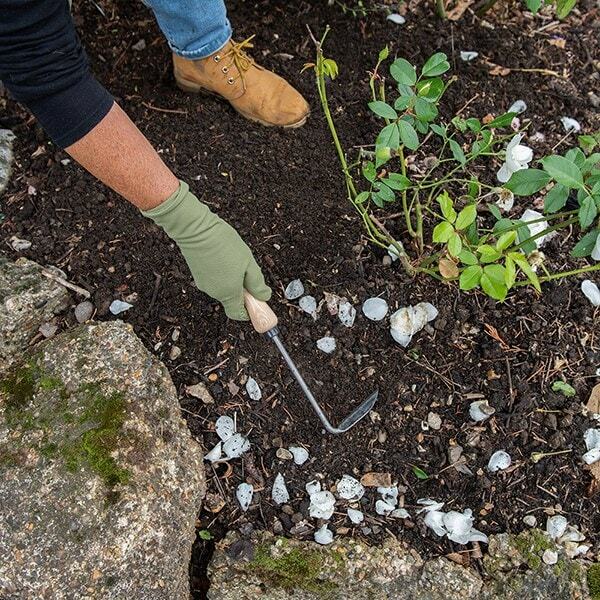 Using the tip you can dig up single weeds without damaging other plants that may be growing nearby. I find it particularly useful for easily digging up weeds growing in gravel paths. Using the long side of the blade you can remove a larger number of weeds very quickly . It does take a short time to get used to holding the handle so the blade is flat to the soil. I have two of these tools as I would hate to be without one even for a short time! As a relatively green allotmenteer, I'm still in the process of assembling a really good collection of tools. After reading a few great reviews of this (and watching a video of it in action) I decided to take the plunge, and I'm so glad I did. It's the best tool I've ever used for weeding in tight spaces. You will need to give it a sharpen before using, but once you have it slides into the soil nice and easily to slice or lift weeds out by the roots. My onion rows have never looked neater! A wonderful little tool. It weeds right up to plant stems and gets into all those difficult little places. It also drags out the ground elder roots and all! I bought one of these after seeing it in RHS literature. It is simply the best tool I have ever used for amongst plants or in borders. It can be used as a hoe to cut the roots off, best done in drier weather so there is no chance of re rooting, as a hook to pull weeds out, or as a mini pick to remove tap roots. Shortly thereafter I lost it to my wife, ;-) and had to buy another! My gardening sister came to visit and was so impressed she wanted one too. As a result they are gradually spreading around our gardening friends! A word of warning, don't leave them lying around, for both I and my sister have lost them whilst working on the front of our properties. Not cheap, but we'll worth the money!